Dimensions: 8 7/8" x 10"
With the excitement and innocence of a Independence Day parade, July Flags bursts with juxtaposing red, white and blue in an explosion of light and patriotism. At unusual angles, overlapping, transparent, or upside down, the flags blend into a collage that celebrates the bright joy of independence, and the uniquely American delight in diversity. 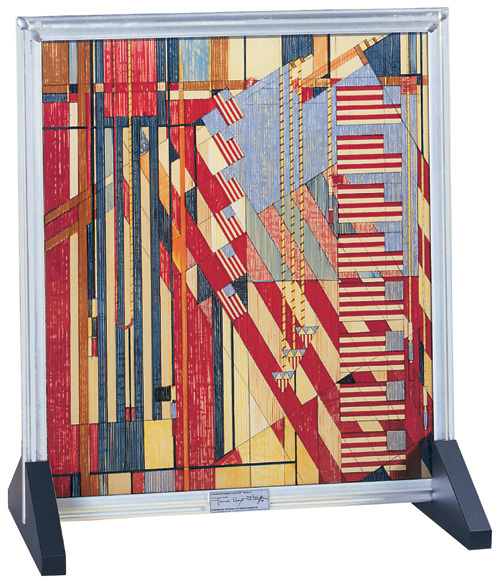 This Frank Lloyd Wright Collection product is authorized by the Frank Lloyd Wright Foundation. Taliesin West, Scottsdale, Arizona and has been developed with the cooperation of the Dana-Thomas House Foundation. A portion of the sales of this product supports the conservation and education programs of these institutions. The Dana-Thomas House is administered by the Illinois Historic Preservation Agency.